Well, I can't take credit for this recipe - seems to be a trend here, doesn't it? Though, I suppose most people who share recipes aren't the originators of said recipes, so I'll not obsess over my lack of recipe-creating genius. I'll be honest. I have not yet met a brownie I haven't liked, though I'm a bit a simplist where brownies are concerned. There are some very good brownies out there that add nuts or cream cheese or peanut butter or whathaveyou, and I will eat them up, no problem. However, when I have a choice, they are always just plain ole brownies. Nothing fancy. Just warm gooey deliciousness. 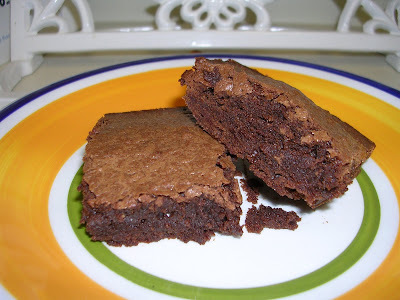 So, since I'm not too particular so long as it's a brownie (seriously, I'm happy with the box mix when in a brownie-needing pinch), I will share Hubby's favorite brownie recipe. This recipe is from his mom - I don't know where she got it from, but when Hubby hears 'brownies', these are what he expects! Enjoy! Place chocolate and butter in microwave safe bowl. Microwave at 75% Power one minute at a time, stirring after each minute, until creamy and blended. Add sugar and mix well. Temper eggs in separate bowl, then add to chocolate mixture. Add vanilla and mix well. Add flour and stir until well blended. Pour batter into buttered 8x8 pan. Bake at 350 degrees for about 30 minutes.